Consumers also are in better financial shape, thanks to reductions in debt and the Fed’s record-low interest rates. Household-debt payments as a share of disposable income stood at 11 percent in the third quarter, the lowest since 1994 and down from a peak of 14 percent set in 2007, according to data from the central bank. That has freed up money for spending, and the automobile industry is a beneficiary….The average age of cars and light trucks on the road today has risen to 10.6 years, Jenny Lin, senior U.S. economist at Dearborn, Michigan-based Ford Motor Co., said on a Dec. 1 conference call. That’s above the seven-to-7.5 years Ballew says is the long-term average. Karl Smith keeps telling me that this is what’s going to spark a strong recovery in 2012. 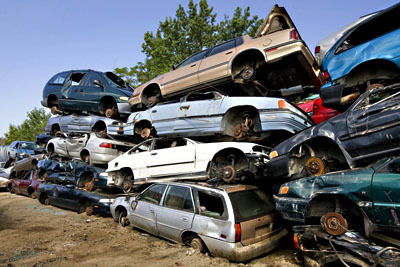 At some point, all those cars just have to be replaced, and that spending will drive improvement in the economy. Ditto for pent-up demand for houses and apartments. I really want to believe this. I do, I do, I do. But with wages stagnant, credit tight, unemployment high, and the world economy flatlining, where’s the money going to come from? I want to have faith in Smithianism, but my faith is tested whenever I open a newspaper — and I open a newspaper a dozen times every day. It is a stern and demanding creed, Smithianism is.